The Los Angeles Lakers will retire both jersey numbers worn by club legend Kobe Bryant during a December 18 game against NBA champions the Golden State Warriors. Los Angeles Lakers forward Kobe Bryant walks onto the court for their NBA game against the Utah Jazz in Salt Lake City, Utah, in this March 28, 2016, photo. The Lakers announced on September 12, 2017, that they will retire Bryant's No. 8 and No. 24 jerseys in a ceremony on December 18 during their game against the Golden State Warriors. One retired jersey number just isn't enough for Kobe Bryant and the Los Angeles Lakers. The Lakers will retire Bryant's No. 8 and No. 24 in a ceremony on December 18 during their game against Golden State, the franchise announced on Tuesday. Bryant wore No. 8 from 1996 to 2006, when he switched to No. 24 for the remainder of a 20-year career spent entirely with the Lakers. He will be the 10th player honored by the Lakers with a retired number hung high on the Staples Center wall, but the first in Nationa Basketball Association history to have two numbers retired by the same team. "Kobe's jerseys are taking their rightful home next to the greatest Lakers of all time," Lakers owner Jeanie Buss said. "There was never any doubt this day would come. The only question was when. Once again, Lakers fans will celebrate our hero, and once again, our foes will envy the legendary Kobe Bryant." The five-time NBA champion and 18-time All-Star selection is the Lakers' franchise leader in points (33,643), games played (1,346), 3-pointers (1,827), steals (1,944) and free throws (8,378), among countless superlatives. Bryant is the third-leading scorer in NBA history after becoming the first player to spend at least 20 seasons with one franchise. He retired in 2016 with a bravura 60-point performance in his farewell game against Utah. "As a kid growing up in Italy, I always dreamed of my jersey hanging in the Lakers rafters, but I certainly never imagined two of them," Bryant said in a statement. "The Lakers have bestowed a huge honor on me, and I'm grateful for the fans' enthusiasm around this game." Bryant scored almost exactly as many points in his No. 8 jersey (16,777) as he did while wearing No. 24 (16,866). He returned to his high school jersey numbers midway through his career in an attempt at a fresh start following allegations of sexual assault leveled against him three years earlier, causing him to lose numerous sponsorship deals even after the case was dropped by Colorado authorities. The 16-time NBA champions Lakers have only retired the numbers of Hall of Fame players: Wilt Chamberlain (13), Elgin Baylor (22), Gail Goodrich (25), Magic Johnson (32), Kareem Abdul-Jabbar (33), Shaquille O'Neal (34), James Worthy (42), Jerry West (44) and Jamaal Wilkes (52). O'Neal's jersey was the most recent to be hung on the wall in 2013. Bryant is eligible to enter the Hall of Fame in 2021, but the Lakers decided not to wait for that formality to enshrine Kobe in their own exclusive club. "This honor is very well deserved," said Johnson, now the Lakers' president of basketball operations. "Kobe was one of the greatest Lakers and NBA players of all-time, and he's definitely on my Mount Rushmore." Bryant teamed with O'Neal to win three consecutive NBA titles from 2000-02, and he worked with Pau Gasol to win two more in 2009 and 2010. The Lakers struggled late in his career while Bryant ended three consecutive seasons early with injuries, and the franchise delayed its rebuilding in favor of showcasing Bryant to his adoring worldwide fans. 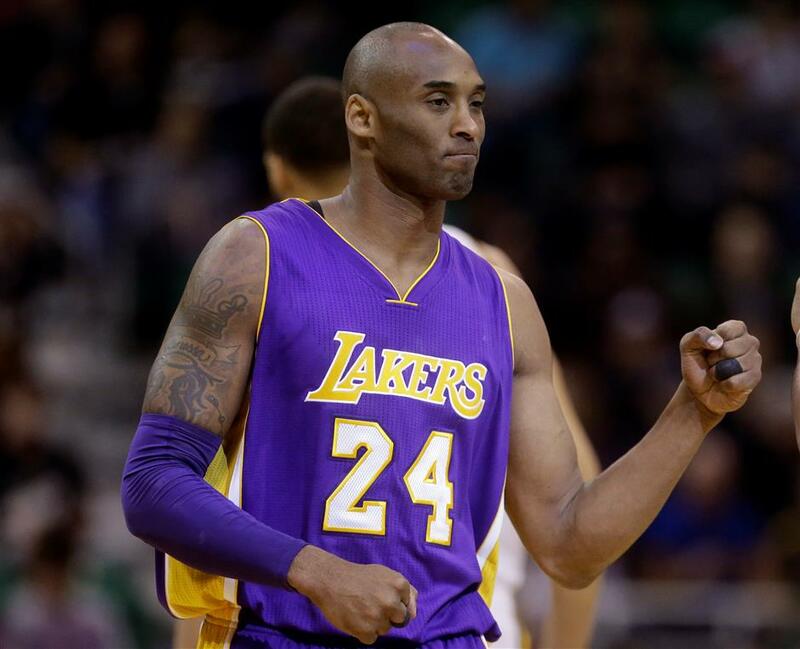 Bryant largely stayed away from basketball during retirement over the past year, but his influence remains outsized on the Lakers. Rob Pelinka, Bryant's longtime agent, became the Lakers' general manager in February when Buss put Johnson in charge of the front office. "Kobe carried the torch for the Lakers for 20 seasons, keeping the franchise at the forefront of the NBA following the 'Showtime' Era," Pelinka said. "Beyond the championship banners and individual accolades, Kobe's 'Mamba Mentality' is something the Lakers will always try to emulate. It alone daily inspires all of us to strive for greatness."